Nian Aziz, a Kurdish film actress and a photo model, credits her supportive family and particularly her mother for encouraging her to pursue her dreams and not allow her height to hold her back. The 27-year-old was the last of five children born into the family. Her father was killed when Aziz was born. She says her mother has made her not feel the gap left behind by the passing of her father. “My mother replaced my father. I will never forget that,” said Aziz, who was born with dwarfism. Aziz spoke about how she became interested in film as a child. “I took part in school activities when I was very young. We were participating in doing the theatre. I continued until I got to doing cinematic work,” she said. Her first appearance in cinematic work was in the film ‘El clásico’ directed by Halkawt Mustafa. It was shown in 56 countries and awarded in Norway, where Aziz couldn't participate because she broke her leg. She explained that Shwan Atufi, a film producer, has a project next year and that he has asked her to play a main role. 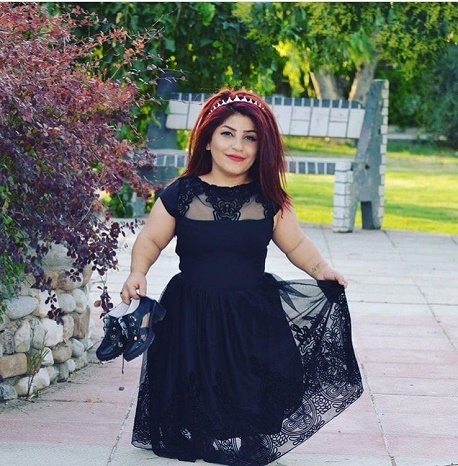 Aziz published some new photos recently on social networking websites, drawing peoples’ attention that a short woman is modeling in Kurdistan and Iraq. “Photo modeling was my childhood dream. I have always wanted to rival international models. That is why I chose to pursue modeling. I am proud that my family is completely supportive of me. This made me take better steps and confront the obstacles bravely. I have never felt my disability because my family taught me self-confidence,” she explained. However, she also became hopeful when she networked with other little people. “After my family, I am highly indebted to the little people’s community who taught me hope, optimism and many other things. They taught me that our objectives are more than those of the ordinary people. They opened the lock of the door of my dreams,” Aziz said. Aziz said that many places ask her to do advertisement and photography for them, but she enjoys having control over how her images are used. “I don't want to appear on TV every day. I want to appear occasionally but tidy. After all, you can’t work for any organization or person that asks you to work for them. You need to know your own worth. Not every place is worthy of working at,” Aziz said. “I want to appear in semi-revealing clothes. But I don't want to wear clothing that is inappropriate or strange to my culture because I am a member of this society who views me with love and respect,” Aziz detailed. Aziz likes art but would be willing to give it up if that leads to love and marriage. “I will give up on art if my marriage is conditional on doing so, providing that he treats me with love and respect. I have no lover and marriage has not so far been on my agenda,” she said.